It’s hard to find an all-organic commercial fresh salsa. There are plenty of jarred organic options out there. But fresh? Very rare (at least, in my experience). Fortunately, it’s fairly easy to make homemade fresh salsa with wholesome, additive-free, all-organic ingredients. That being said, I have to admit: I can’t take credit for this recipe. This recipe is all Jeremy’s. He is the salsa connoisseur in our household, so whether store-bought or homemade, he’s tried just about everything. 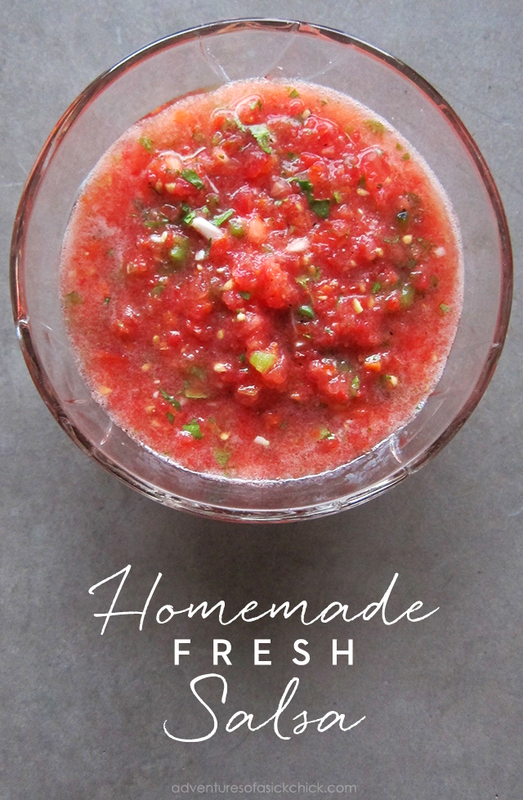 After experimenting with numerous recipes over the last several years, this is one of our favorite versions of his homemade fresh salsa. Of course, it’s naturally gluten-free, grain-free, dairy-free, Paleo, vegan, and Whole30 friendly, plus it’s packed with antioxidants, vitamin C and vitamin A. It’s simple, healthy and refreshing, and just in time for your Cinco de Mayo or Memorial Day celebrations! Place jalapeño pepper directly on a stovetop gas burner and roast for about 6-10 minutes or until the skin blackens and softens. Rotate the pepper periodically (preferably with metal tongs) so it roasts evenly. Remove pepper from burner and set it aside to cool. Once cool to the touch, peel off and discard the blackened skin. Finely chop the "meat" of the pepper and place it in small or medium bowl. Note: for “hot” salsa, use the whole jalapeño; for medium salsa, use only ½ of the jalapeño; for “mild” salsa, use only ¼ of the jalapeño. Core and then finely chop one of the tomatoes and add to the bowl. Add chopped shallots (or onion), scallions/green onion, cilantro, salt and pepper into the bowl and gently stir for one minute. 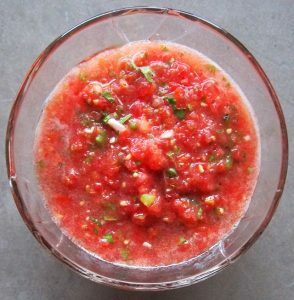 Refrigerate salsa mix for a several hours so the ingredients can marinate (you can certainly enjoy it right away, but the longer it marinates, the more flavorful your salsa will be). Enjoy as a snack or as a garnish with your favorite meal.